Brad Binder (Red Bull KTM Ajo) began his journey to world champion as a Red Bull Rookie in 2009, making steady progress before 2012 and his first full time entry onto the world stage with RW Racing GP. He took 24 points in a solid rookie season – using that as a foundation for the year after as he moved to Ambrogio Racing and ended the year 13th in the title, ready for the next step: get on the podium. 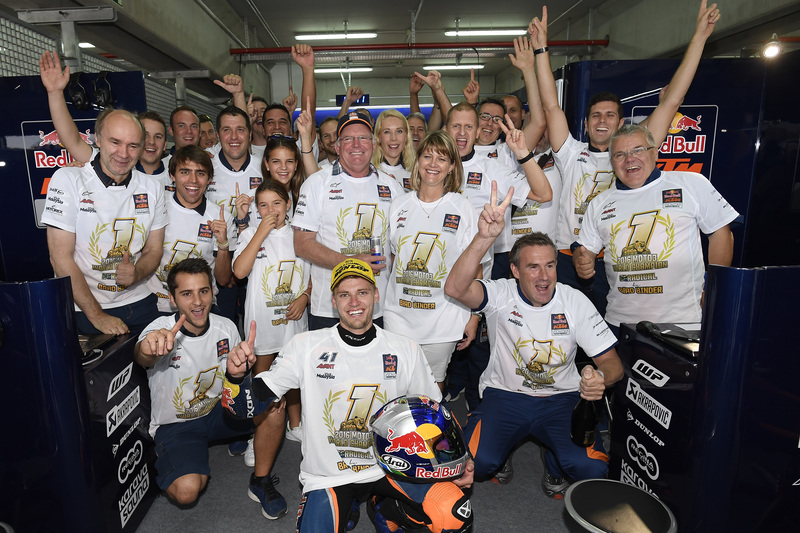 2014 was the year Binder first enjoyed the taste of cava on the world championship stage with two rostrum finishes, setting the scene for a move to Red Bull KTM Ajo, with the South African ready to join a team so often a title-challenger in the lower class. Beginning 2016 with three podiums in a row and a pole position in Argentina, the fuse on his championship challenge was really lit at the Spanish Grand Prix in Jerez, in which he took his maiden win. Starting from the back of the grid after a technical infringement, the South African fought his way back through with almost unbelievable aggression and speed, soon heading the second group and on the way to catching the front freight train in the Moto3™ battle. Arriving with laps to spare, the 2016 Moto3™world champion then passed his rivals and tucked back in – taking the victory with a comfortable margin and announcing his intentions for the year. With his first win under his belt, Binder’s success simply continued to roll, winning the two subsequent races and suffering only one DNF in wet conditions in Brno; crashing out the lead in the Czech GP proving the only blot on his 2016 record. Four more wins and a stunning 106 point margin upon arrival to the Gran Premio Movistar de Aragon in September saw Binder with his first mathematical shot at the title – and the odds were not long. Qualifying in P7 and then keeping his cool despite the crown waiting for him at the finish line, Binder raced how he knows how – to win. With Bastianini and Navarro initially breaking away at the front, the South African kept himself in it and laid it on the line into the final corner – not quite enough for the victory, but more than enough for the championship as he crossed the line only 0.030 off winner Navarro. Binder is the first man ever to be crowned at MotorLand Aragon, becoming the third South African champion in history after one of the most incredible title campaigns in recent seasons. 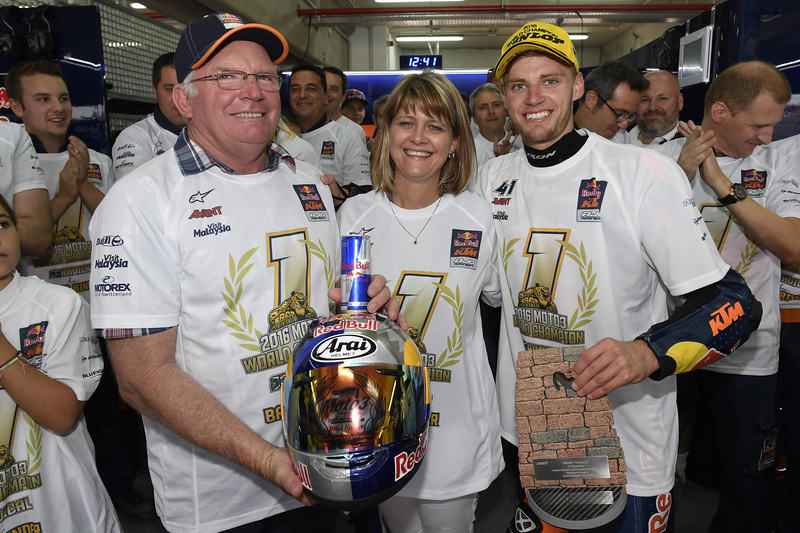 • Brad Binder is the first South African rider to win a grand prix world title in any class since Jon Ekerold won the 350cc title in 1980. • He is the first ever South African rider to win the lightweight-class world title. • He has won the world title with four races of the season remaining, something that has never previously been achieved in the lightweight-class of grand prix racing under the current scoring system introduced in 1993. • This is the third time that a KTM rider has won the Moto3 world title, adding to the championships won by Sandro Cortese in 2012 and Maverick Viñales in 2013. • At the age of 21 years 45 days, Binder is the youngest ever South African to win a grand prix world title. • Binder took the lead of the championship when he finished third at the second race of the year in Argentina and has remained at the head of the championship table throughout the rest of the season.